Watch the European hit-musical ELISABETH in videos with English subtitles. Read the amazing story of Elisabeth of Bavaria, Empress of Austria and Queen of Hungary. Who was Elisabeth of Bavaria? The musical ELISABETH has conquered audiences all over Europe and Japan. In fact, it is the most successful German-language musical of all time. Let's take a closer look at the story of this remarkable woman nick-named "Sisi", and later on watch the videos of the Viennese anniversary performance with English subtitles. Sisi was born in 1837 to a Bavarian family of high nobility, where she grew up in a worry-free environment. At age 15, she attended the festivities in honor of her older sister's introduction to the Austrian Emperor Franz Josef. A marriage arrangement was in the air! However, the Emperor had only eyes for Elisabeth, and in the end he proposed to her instead of her sister. Then he took his young fiancée back to the Viennese Court and prepared for a fairy-tale Royal Wedding. Young Sisi hated everything about her new role as the Emperor's wife, especially the strict court protocol and her domineering mother-in-law. After her initial miscarriage, and after being brutally overruled by the Emperor's mother in regard to the education and care of her next three children, Elisabeth fell into deep depression and suicidal thoughts. A love affair with Death seemed to offer the only relief from her misery. But Sisi resisted the dark allure of Death and fled the confinements of Vienna. She traveled to the most beautiful places of Europe in a desperate effort to escape her loneliness. Eventually, the Emperor reunited with his wife at the point of her coronation as Queen of Hungary. When her only son Rudolph committed suicide, Elisabeth's death wish returned and she begged Death to take her away. Another decade went by before her wish was fulfilled. On September 10, 1898, Elisabeth of Bavaria, Empress of Austria and Queen of Hungary was murdered by a mad assassin. Who wrote the musical "Elisabeth"
In the 1980's, the German songwriter, lyricist and librettist Dr. Michael Kunze had made a huge name for himself as the top German-language adapter of the world's most successful musicals: Cats, A Chorus Line, Phantom of the Opera, Wicked, The Lion King, Mamma Mia!...to list a few. Toward the end of the decade, he was researching suitable topics for his first own, original musical. Kunze had created a new musical genre: the drama musical. Here--in contrast to the typical song-and-dance Broadway musical--every element of the show has only one purpose: to serve the telling of the story. Music, lighting, dance scenes, stage design, etc....if it doesn't contribute to the dramatic development of the story material, it will be discarded. A major element of a drama musical is the story path of its protagonist. As Michael puts it, the hero must overcome a number of shortcomings to reach his goal. At the beginning of the drama, the protagonist finds him/herself in a "hole", with seemingly insurmountable odds stacked against his/her ambitions. Only by growing and learning, and by resisting the powerful forces of one or more antagonists, the hero will finally be able to climb out of this hole and reach the desired destination. The story of Elisabeth of Bavaria offered the perfect dramatic elements for Michael Kunze's vision of a drama musical. Sylvester Levay agreed to write the score, and the muscial ELISABETH premiered in 1992, at the Viennese Theater an der Wien. Watch the entire musical "Elisabeth" in the following YouTube videos. The subtitels have been provided by the video creator and are not an official English version of the original libretto. Do you think ELISABETH would be successful in America? Did you watch it? What do you think about the drama musical ELISABETH? chefkeem, Thank you for the backstory and YouTubes. Unfortunately, not one of the videos is available because of blocking by Merlin Ordis, according to the video messages. Isn't it tragic how Romy Schneider played Sissi and sustained the same tragedies in losing her son and taking her life? I yearn for Elisabeth to come to NYC. I can't understand why it has not. It is an international diamond. It exudes so many of life's profound, beautiful , and painful issues. I am smitten, dazzled, awed, and enamoured. Elisabeth will eclipse all other broadway gems, beautiful tho they are. It's emotional, musical, and intellectual depth will establish it on a Broadway marquee for decades. generations of fans will shout "elisabeth, elisabeth"; a triumph. Thanks for introducing me to Elisabeth. I will return to this page again! Her story engages the imagination and emotions. No wonder people love this musical! This is great!! Thank you so much for sharing!!! First time I've heard any of it. Great idea. How very clever to be able to watch the entire musical Elisabeth through the series of you tube videos, I didn't watch the entire series, but what I did was very enjoyable. Perfect gifts for Phantom fans, or table decorations for Phantom of the Opera themed parties. Come on and embrace the music of the night. 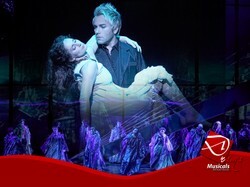 REBECCA, the European Hit Musical by Michael Kunze and Sylvester Levay, will have its Broadway premiere October 30, 2012. Update: The show has been cancelled!